A common feature in every crisis situation, from the upheavals of the early 20th century to the neo-liberal re-structurings of the late 20th century, is the emergence of workers’ control – workers organising to take over their workplaces in order to defend their jobs and their communities. We interviewed Dario Azzellini* to talk about this issue in depth: the emergence of new values and social relations not just in the recuperated workplaces but also in the communities, the need to re-orient production, the overcoming of the separation between political, economic and social spheres, and the role of workers’ control in the larger struggle against capitalism. Why is workers’ control an important issue? It is an important issue because if we look at what is socialism, what Karl Marx described, the living example for him is the Paris Commune. It is the people taking matters into their own hands, and the state as such disappears because power is no longer delegated. But I would say that workers’ control is one first step on a path to socialism, in the sense that control over production and workplace should not be only on behalf of the workers but also of the communities, the self-organised people in general. And even that is still not the last step, because as Marx says, the commune is the finally discovered political form, so it is still a political form. Socialism, or communism, is about going beyond politics, achieving the self-organisation of life. So these are all intermediary steps, and even the commune would not be the final form, but we cannot even imagine the final form, because we are trapped in the imagination of what we know and what has been done. What has to be developed is probably beyond our imagination now. Yes, because if workers take charge of their workplaces and decide on production, the labour processes, the values, everything changes, we have seen that in worker-controlled places. Security and health questions become central, and they are far from it in capitalist workplaces. For example, many worker-controlled workplaces start working with organic, or less toxic, production, because they are exposed to it. So once workers can decide, these questions become central. The struggle is no longer only about wage raises, which is the only struggle more or less allowed in the framework of capitalist society. Instead workers’ control is automatically challenging capitalism. We have a central field of conflict, and obviously all the other fronts, like gender, race, etc., are equally important. But labour and production are not only fundamental for society but also a field we all have in common and that is absolutely fundamental for our survival and to the structuring of the whole society. In this field all other contradictions obviously have to be tackled too. We should not forget that the predominant way in which the economy and production are organised reflects on the rest of society. For example, as long as the dominant form of production was Fordism, the rest of society (universities, schools, bureaucracy) was organised in a Fordist way. So there is some kind of leverage if we are talking about labour and workers’ control. In both books you have edited you describe lots of historical scenarios where workers’ control comes into play. What was the purpose of bringing together all these different experiments? We try to show, with the books and the research, how workers’ control is an important and recurring question, and we have to dig and make it known, because nobody is really interested in making it known. Unions have no interest in showing that workers can organise by themselves, parties, which are based on the principle of representation, are also bypassed if the workers organise themselves. And of course capitalists would have even less interest. But it is interesting that workers’ control comes to the fore in every kind of crisis, political, economical, in anti-colonial struggles, during the revolutions of the early 20th century, after WW2 or other wars, when capitalism is not able to develop because capitalists will invest into speculation and commerce and not into production, it happened during the neoliberal re-structurings of the early 80s, etc. So it happened always, not because the workers knew of previous experiments, but because it was something anthropologically present in the workers – get together, self-organise in a democratic way and try keep up the production, benefiting themselves and the people around them. What are the common features among all these different workers’ control attempts? This is the first common aspect, that in any situation of crisis, there are always workers that take responsibility for their jobs, for their workplaces, and for the people, for society. The second thing is that they choose democratic structures that are based on equality, they do not simply elect a new boss. Hierarchies disappear, it does not really matter what position was previously held in the production chain. That does not determine what one is able to do in a crisis. For example there is the Junin clinic that is now under workers control in Córdoba, Argentina. I visited it and the head of the cooperative now is the former janitor and technician, because he was the person who was most able to organise the struggle, so he was elected as the formal head of a cooperative, which is still deciding everything in assemblies on a democratic base. This shows that the skills or capacities that are seemingly important in a capitalist hierarchy are not the same ones in a democratic and workers’ assembly based structure. Another common feature is that the workplace switches from a hierarchically organised workplace where the central aim is to produce as much surplus value as possible, to a place where the well-being of the workers and the purpose of production, what you produce and for whom, become the central question. So the social relations in the factory change, especially if these places go through a process of struggle or occupation, against former bosses, or political struggles. There is a trust that is built during these struggles which inevitably forces a change in the social relations. One example of this is that it becomes less rigid that people have to fulfil the same amount of work. Or if people are sick or cannot come to work because their kids are sick, it is not a problem. It is understood by the other workers because of this relation of trust that I mentioned. This naturally contrasts with workplaces with a boss. But also in many traditional cooperatives, which do not have to go through this trust-building struggle, there is also more of a tendency to demand that everyone has to fulfil the same amount of work, there are conflicts about work hours, internal conflicts, etc. Precisely. Especially if they have had a length of struggle, they do not go back, they do not re-install the hierarchies they got rid of. It is a bit different in places that did not have a long struggle. There was a bit of contradictory phenomenon for example in Venezuela (1), where you had a government that was (supposedly) in favour of workers’ control. Workers would occupy a workplace and after two weeks the government would step in, expropriate the workplace and put in some provisional administration to then supposedly pass it over to the workers. At first glance this sounds great, but at the same time the workers did not have the time to form a collective, to build this conscience. So very often you end up having conflicts among the workers, or you would never get to workers’ control because the administration was reluctant to do so. I say it is contradictory because you do not wish that people have to struggle for years without an income for their workplace, but on the other hand it is what then makes these worker-controlled companies really democratic and successful. You mentioned cooperatives, and this is an important point to discuss. Most of these worker-controlled or worker recuperated companies register legally as cooperatives. But as you have said, they are not like usual cooperatives. What are the main differences? The first main difference is that traditional cooperatives usually mean that people that already have similar ideas and values come together to build the cooperative. A workplace recuperation is very different, because everyone is involved. Everyone that is working there is also potentially there when the recuperation takes place. It is something that Gramsci describes when referring to the workers’ councils. He says that they are the real class organisation, because the whole class is there, not just political tendencies. Another very important difference is that traditional cooperatives tend very much to base the right to decide on property, on being an owner of the cooperative. And that is problematic because it is the same logic as capitalism. Recuperated workplaces have democracy on the shop floor, and their starting point is to question private property of the means of production, so capitalism is immediately questioned. At the same time, almost none of these recuperated workplaces have models based on individual shares, or unequal shares, or even outside investors, or employ wage labour, features that are common for cooperatives. So you have all these differences. Most of the time it is still more pleasant to work in a cooperative than in a pure capitalist private company, but what I stress is that cooperatives as such are only a democratisation within the framework of capitalism. Many cooperatives are driven by entrepreneurial or ownership logic, and by doing that they lead workers into what I call a “class limbo”. Workers no longer know that they are workers. This is especially strong in the US, where cooperatives are presented as an alternative business model, and not as an alternative model for society, or communities, or part of the workers’ struggle, which is what cooperativism historically meant. But given the way they live, the way they work, they are not entrepreneurs, they are workers! This is in high contrast with the recuperated workplaces, where workers, having gone through these struggles, see themselves of part of the workers’ movement. There are a lot of recuperated companies in Argentina for example that have the rule that one day of the month they go and support other workers’ struggles, and it is part of their work. In Uruguay when companies in a given sector go on strike, workers in recuperated companies of the same sector go on strike as well so as to not undermine the struggle of the other workers. How would you characterise the relationship between recuperated workplaces and labour unions? It varies a lot, it depends on how the unions work. There have been examples of unions that have supported worker takeovers, and this is very good because they can reach out to a broader public. But most of the times the unions either ignore or intervene in a negative way in these struggles, unfortunately. In any case we should not see trade unionism and workers’ control as antagonistic projects, they are simply two different things, two different fronts of the struggle. One thing is a self-organisation in the workplace that allows for struggles that would not be possible with unions. Unions have their formal recognition and are interested in sticking to rules and laws to keep up this status of a “reliable partner”, so they will not do certain things, like wildcat strikes or occupations. They are not as flexible and not as fast in their decisions as the workers’ assemblies obviously are. You mentioned how new social relations are produced in the workplace, but recuperated companies also create new social relations with their communities. Can you talk about that? Yes, the relation with the community and with other social movements is fundamental. In fact we can put it the other way around. Of the examples of recuperated workplaces (factories, restaurants, print shops, hospitals, etc.) it is usually the ones that have a strong relationship with communities and other social movements that tend to be successful. The ones that tend to be isolated and do not have these strong relationships, often with time either turn into more or less traditional workplaces or cooperatives, withdrawing from the larger struggle, or they simply fail, because they did not have the necessary support. And there is one question that is central to that. In the capitalist system closing down a workplace is simply a legal question. It is not a social question, it is not a political question. The law of the land is a bourgeois law that is based on property. Within these boundaries the chances of achieving something are minimal. So the main challenge for all these workers is to turn a legal question into a political question, and for that you need as much support as possible. You need the support of the communities, of other movements, of unions, maybe even of institutions and political instances. And with that you can win everything. One example is the Republic Doors and Windows, the factory now called New Era Windows in Chicago, which is producing eco-friendly windows. 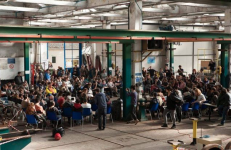 When it was closed down and occupied for the second time, together with Occupy Chicago in 2010-11, the occupation got the workers the possibility to be at the negotiating table about the future of the factory, which they later agreed to buy. And the workers did that by the forcing the banks that had taken over the bankrupted factory to pay them 1.5 million dollars for lost wages. Usually if there is money left (e.g. from selling machinery) it goes to the creditors. But the workers managed to do a political campaign that generated so much public support that the banks saw themselves forced to pay the workers 1.5 million dollars, even if legally they were not obligated to do that. Exactly, and once you do that you can win everything, even things that seem completely impossible or that are not in the existing legal framework. That is one of the big reasons why it is important to have bonds with other movements and communities. The second one is that you create new values. Factory work is usually not fun, not even in a recovered factory. What keeps you working in capitalism is money, but in a recovered workplace the workers find new values, and one of the values is to be useful for society, not just for capitalism. Many of these workplaces, if we are talking about industrial workplaces, are usually situated in poor communities. There are no factories in Beverly Hills! One usual feature of these poor communities is that they lack space. They lack space for social, collective activities. In Argentina for example, where there are more than 400 recuperated workplaces, more than 60% give permanent space to community activities, from bachilleratos populares, i.e. the possibility for adults to re-do their school, to community radio stations, libraries, even just community festivities. So they become an important focus of community life, and the spaces in a certain way become commons, because they are used for other activities which are not immediately linked to production. Can you talk about the need for recuperated factories to re-orient production? Because if these factories are closed because they are not profitable any more, workers cannot just go back to what they were producing before. Indeed, often it is simply not possible to continue the production that existed before. One example is Officine Zero (2), a former night train repair facility in Rome. Night trains are almost gone in Europe, there is only one facility left which is enough for the few night trains that still run. Most of the trains are fast-track trains now, so you cannot continue planning to produce or repair night trains. The workers that took over the factory now engage in a number of activities, such as recycling domestic appliances or furniture, and have continued the workshops they had – upholstery, carpentry, iron works and others. Another example is Rimaflow in Milan (2), which was producing air-conditioning pipes mainly for BMW cars. The owner took out the machines, but even if he had not, BMW was not going to buy air-conditioning pipes from an occupied factory! So you have to re-invent yourself. But that is good, because then the workers start thinking about useful production. Rimaflow started with a mix of activities, for example upcycling and recycling of household electric appliances and computers. Later they raised money for an air-conditioning system and set up a hall to recycle industrial pallets. So they collect industrial pallets from all kinds of factories, put them back together and sell them back. They also started an artisanal food and liquor production, cooperating with organic cooperatives. They produce Rimoncello, which is a lemon liquor (originally Limoncello), together with cooperatives from Southern Italy which pay fair wages to immigrant seasonal workers, and they produce Amaro Partigiano (a digestive liquor) together with the Italian Institute for Partisan Studies. A traditional economist might call this “patchwork”. But I would disagree, this does make sense. We have to transform our society in every sense, so these successful examples of industrial conversion make sense, because naturally we are not occupying the workplaces to simply go on with the same capitalist production we had before. We do not want to take over everything and then keep producing military helicopters! Along these lines: in capitalist societies, in liberal democracies, there is a separation between economic, social and political spheres. How do worker recuperated companies, by themselves and through their relations with communities, challenge this separation? Yes, I think that is a central aspect of what we can call “council democracy” as a model for communes, worker-controlled workplaces, etc. Capitalism, and bourgeois society, is always based on the division of spheres. The first step is the division between the political and social spheres, which is never justified, it is there to be accepted a priori. Because there is no reason why some people should be governing and others should be governed. The second separation is that the economic sphere is supposed to be separate, autonomous, often likened to living organism that society has to keep feeding. We get to this point where it sounds mythological, like the market is this kind of dragon that needs to be fed all the time otherwise it will get angry and destroy everyone! Which is also totally absurd, because the economy should be serving society, it should be serving the people, not the other way around. The recuperated workplaces are obviously an overcoming of that. First of all because usually there is no representation, there are only spokespeople. The decisions are taken by the people concerned with the issues and not delegated, which is the foundation of the separate political sphere. Secondly, the economic decisions are also taken directly by those involved in the production process, and subject to their political decisions and social needs. So this separation of spheres is tendentially overcome. There is a second division of spheres which is characteristic to capitalism and bourgeois society, that is also tendentially overcome, namely the division between intellectual and manual work. The person that is unloading the pallets from the truck has as much to say in the assemblies as the engineer that is adjusting the computer-led production process, for example. It is also quite common to have much more job rotation, people learning new tasks and developing new ideas, therefore there is much less of the traditional division of labour and particularly between intellectual and manual work. Also when we talk about overcoming the division between political, social and economic spheres, we should always stress that this is a “tendency towards…”. Because as long as we are in a capitalist system it would be an illusion to think that we can be totally move beyond that. You cannot create a happy island in the capitalist system. You can work towards overcoming the system, which means you have to expand. One of the things they always stressed in Rimaflow was that they needed to build a new economy because the economy of the bosses is not working anymore, and we can be successful if examples such as Rimaflow occur 100, 1000 times. A happy little island will not survive, the system will crush it. Many cooperatives had a lot of idealism concerning this issue, and their ideals faded away with the age of the members and immersion in capitalism, or the cooperatives got big and got bought up. That is why I am always speaking of a tendency towards building a new economy, overcoming the separation of spheres, etc. With globalisation and the evolution of capitalism, there is a fragmentation or an atomisation of the production chain. Does this present new challenges for workers’ control, or make this question more urgent? Yes, it presents new challenges but also new opportunities. For example, the necessity of building local and regional economies is growing. Because of the ongoing globalisation, capital is concentrating more and more in ever fewer metropolitan spaces. So the necessity to build local and regional economic systems, and to keep wealth where it is produced, is becoming more urgent. This represents a chance for workers’ control and more localised production and distribution. The fragmentation of the production chain is itself a very contradictory issue. For example in the US, there is a tendency of insourcing again. Car manufacturers in the US are insourcing again a lot of production steps that they had outsourced before. This proves that the outsourcing was never about saving money or being more efficient, it was simply about the destruction of the workers’ power. So now that they have destroyed the unions in the car sector, that used to be some of the few strong unions in the US, they are insourcing again all these production steps. But the fragmentation, which is not only a fragmentation of the production chain but also inside the workplace itself, makes it a much more subjective act to be collective and to struggle than it was before. You had companies like Fiat, which had 70 or 80 thousand workers which were automatically organised because 95% of them had the same contract and the same work conditions. You look now at the same Fiat factory, it has 12 thousand workers that have probably 40 different kinds of contracts, from part-time contracts, to sub-contracted labourers, to insourced work, or seasonal labour, and at the same time you have another 70.000 workers in the greater region of Turin which are working in different outsourced, independent companies, or even as independent workers. Exactly, it becomes a race to the bottom, in the form of part-time contracts, or temporary work, and with all these divisions among workers. It is creating a very problematic situation, also from the point of view of production, and that is why I think it is very important to take over as many workplaces as possible, and to use these workplaces, as well cooperatives that place themselves into a political/labour/class struggle logic, to build production chains. For example in Argentina, a study of about 80 recuperated factories showed that over 16% of the commercial activity, sales or buying resources and parts, was done with other recuperated workplaces, and almost 2% was with the solidarity economy or other kinds of cooperatives (3). This means that almost 20% of what they are doing is in a cycle that, while not being complete out of capitalism, does not strictly follow the rules of capitalism. You are supporting different labour relations and social relations by having these economic relationships. Therefore I think it is important that we have as many worker-controlled workplaces as possible and that we also start thinking about creating production chains. To finish, do you want to tell us about the website workerscontrol.net that you helped found? What we are trying to do is to create a virtual archive with workers’ control experiences from all kinds of epochs and different languages. We have functioning Spanish, Italian, French, English, German, Portuguese and Greek. The idea was to build a network of researchers and activists from recuperated workplaces, to make available as many experiences as possible. Because up to now there was nothing like that, you only had websites or sources dedicated to specific authors or to specific recuperated workplaces. We founded it also as a decentralised network, there is no central group reviewing what can be on the website or not, so all the nodes are autonomous and free to publish whatever they think is useful in the framework of workers’ control. It is an interesting network of collaboration between people with different political orientations, people that consider themselves council communists, or more anarcho-syndicalists, others Luxemburgian or Gramscian, others Trotskyist, others might be more workerist/operaist, others more traditional Marxists. What we all have in common is that we support workers’ control and want to create access to as much information as possible. We are now in a process of redesigning the website, which will be relaunched in a few months with a new design and more visibility. (2) The documentary “Occupy, Resist, Produce” dedicated to Rimaflow is available here. The one dedicated to Officine Zero is available here. (3) Information from this report, pages 35-36.